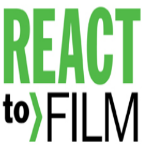 In preparation for my upcoming trip to Brazil for the Sao Paulo Bienal I wanted to write about two artists whose films I have found to be transformative. Ai Weiwei’s Never Sorry and Vik Muniz’ Wasteland are two films that successfully give you access to the mind of the artist and the world they are trying to change. Vik Muniz, a Brazilian born artist now living in Brooklyn became known in the 90s for making photographs of famous images that he would reproduce using unusual mediums. 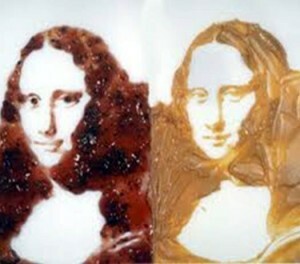 He did one, for example, of the Mona Lisa in peanut butter and another in jelly. He did Davinci’s Last Super out of chocolate syrup. I went to see Muniz’s retrospective at PS1 in November 2009 and even though I enjoyed the show and like his work, at the time I remember feeling that as an artist he seemed to be stuck. His work was not evolving. Three years later I was taken aback when I saw his film Wasteland. Wasteland tells the story of an enormous artistic endeavor. 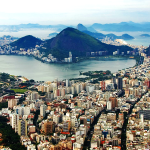 An idea so big that it could only come from Brazil. 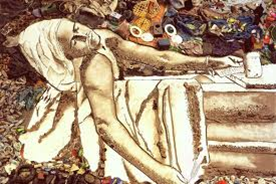 Instead of recreating works in materials like sugar, chocolate or diamond dust, this time he used trash from Jardim Gramacho, one of the world’s largest dumps. Muniz works with a group of pickers, people who scout through tons of trash looking for recyclables and other goods they can sell off. 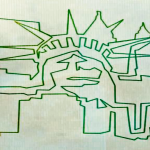 In the end Vik, with the help of the community, builds massive images from trash which he then photographs and sells for hundreds of thousands of dollars, profits of which he shares with the pickers so desperately in need. My favorite one is Death of Marat, a powerful image he recreated using Tiao, his favorite picker as the model. The film is brilliant and inspiring and a must see for anyone interested in contemporary photography and Brazil. Ai Wei Wei’s Never Sorry tells the story of an artist in China whose success has made him an outcast in a society that is very unforgiving. 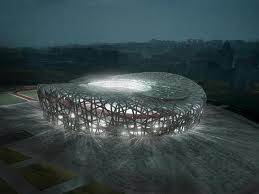 To most Weiwei is known for helping design the Birds Nest stadium with Herzog and De Meuron at the Beijing Olympics or for the photograph he took giving Tiananmen Square the finger. But Weiwei is much more than that, Weiwei is an activist whose ethos is digital. Digital media is what drives him, it’s the motor behind his ideas, and it’s what makes his brain tick and it’s how he challenges “the system” in China. Weiwei is a digital dissident. 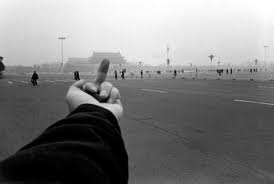 Ai Weiwei has found a way to challenge the Chinese authoritarian regime through digital media. One of the projects highlighted in the film is the investigation he did on the victims of the 2008 earthquake where thousands of children died unnecessarily because the schools they attended where poorly built by the state and collapsed on them. Before Weiwei presented his findings, the government was vastly underplaying the number of victims. Never Sorry is a film for any one participating in the digital revolution and a must see if you are interested in the intersection of art, politics and media.